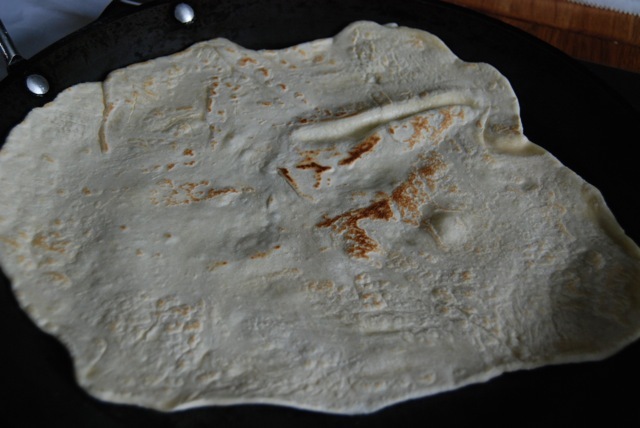 Flour tortillas – oooh how I love thee! Your soft, pliable curves, your tender nibblish folds. The way you bring a host of disparate elements into one unified form. You make life so deliciously easy, so healthy, so…. So why am I going on and on about my love of flour tortillas? Well, like every woman who lusts from afar, I’ve got it bad for something I can’t have. Most low-sodium dieters know. Store-bought flour tortillas are pretty much out on a salt-free diet. Commercial brands range in the hundreds of milligrams of sodium per tortilla, and many of those have ingredients I can’t even recognize, let alone pronounce. Years ago I found an alternative in Garden City Lavash. These are large tortilla-like wraps sold at many Whole Foods markets, and with less than 50 mgs per serving in either white or whole wheat, they’re a dream. But what if you don’t have a Whole Foods nearby? There are always corn tortillas, which average a mere 12 mg sodium. But if you’re like me and really prefer flour tortillas to corn, why not make your own? 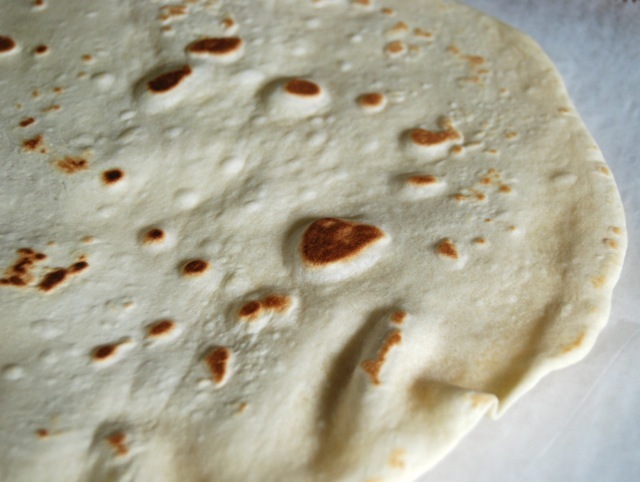 Making your own flour tortillas isn’t hard. It is however a bit time consuming, so best saved for a day when you can be leisurely and really enjoy yourself. 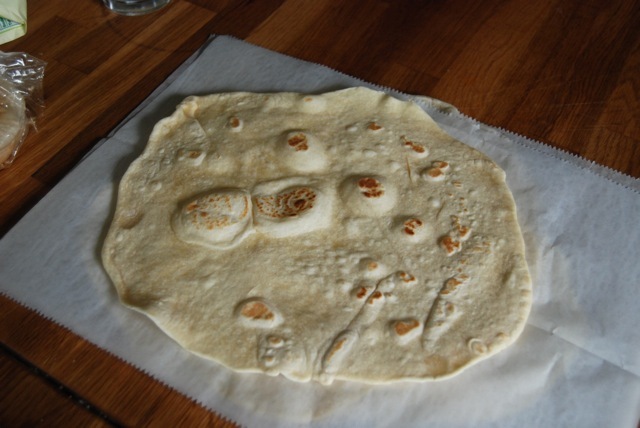 If you have a silpat with pre-measured circles, you can make such flawless flour tortillas no one will be able to tell the difference between yours and the store-bought kind. Mine? Well, let’s just say I don’t own a silpat. So perhaps some of my tortillas came out a bit less than round. More like amoebas. But boy did they taste good! Somehow I’d imagined there was some trick to making them, that homemade tortillas wouldn’t have the same soft chew of the packaged kind. Although mine were a little less perfect looking than their store-bought brethren, in taste there was no noticeable difference. And the weird shapes only added to their charm. This homemade flour dough is soft and workable and the creative process was really fun, especially if you’re someone drawn to tactile experiences. The kneading, rolling and cooking make you feel very “real” in the very best sense of the word. I could almost picture myself flipping these outside over an open fire. Okay – not quite. But maybe next time. Huge thanks to Sue Tweeton and her marvelous blog PLEASE, Don’t Pass the Salt! for this recipe. I’ve reproduced it below; please direct all praise her way! Place flour, salt, baking powder in food processor and pulse to mix. Cut in shortening and then add the WARM water; process to make a soft dough. Dough should be soft but not wet and sticky. (Shambo’s note: I needed to add about 1-2 tablespoons extra water.) Wrap dough in plastic and let rest for at least 30 minutes. Divide dough into 10 equal pieces and shape into balls. Keep covered. Let the dough balls rest for about 15-20 minutes. Roll each ball out into a 7-9 inch circle. Dough should be thin. Cook on a dry hot grill or frying pan on medium heat, turning once. Do not overcook or they will be hard. (Shambo’s note: I generally cook them about 25 -30 seconds per side. I use a timer. However, once you’ve got a few brown spots on the 2nd side, it’s time to remove them from the heat.) 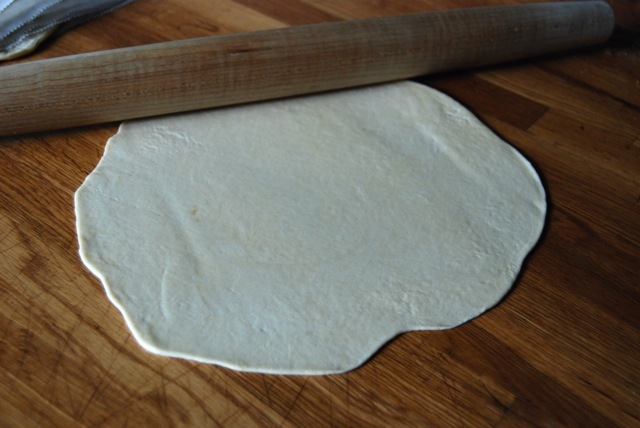 Stack the tortillas with waxed paper or parchment between them to keep layers separate. Use immediately or store in a zip-top plastic bag for freshness. This entry was posted in Bread and tagged Garden City Lavash, low sodium flour tortillas, PLEASE Don't Pass the Salt!, Susan "Shambo" Tweeton. Bookmark the permalink. Hey Sam, I was just over at your place! Your challah looks AMAZING. And I bet I know who you were looking up. KG? am I right?! I am so flattered to have inspired such salt-free research. It’s crazy how much sodium is in things that don’t taste remotely salty. Like flour tortillas, artisan breads & much more. I never thought about any of it before being diagnosed w/ Meniere’s. That’s the rub. People are consuming far more sodium that they’d otherwise guess or expect b.c it’s so sneaky. Glad to raise awareness! Meanwhile, 4 years later, I have found your blog. I have been traveling the same path, diagnosed with Menieres and trying to cook delicious food without salting myself to deafness. Thanks for the recipe.. it’s gyros tonight with enough salt to taste good while keeping that daily total under 2000 mg thanks to homemade wraps and sodium-free baking powder from Healthy Heart Market.. They look great!! I think I’d probably use a big mixing bowl as a cookie cutter to make uniform round shapes, but I’m a nerd like that. I really might make these-we are big on tacos and fajitas over here. Wow – you MAKE tortillas, too?! Incredible, Dishy – your culinary skills never cease to amaze! Seriously… please tell me you will be appearing on MasterChef! I swear Inky, sometimes I wonder if my husband pays you. You are TOO HONKIN NICE! Christy, I’m so happy the recipe turned out for you. Of course, I must credit Ann T from the Cooking Forum. She’s a great cook, and is always willing to share recipes and encourage others to venture out. 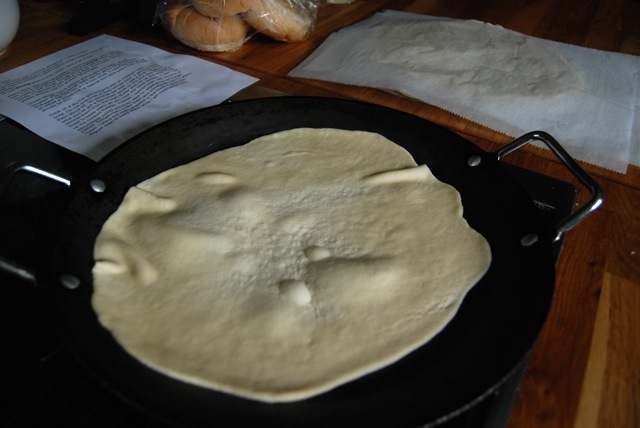 Like you, I was amazed at how easy it was to make homemade flour tortillas. I worried that only someone with super rolling pin skills could produce a decent tortilla. And I agree with you 100% about the sodium in the grocery store products. It’s so disheartening. Yes, corn tortillas are very low in sodium. And yes, they make tasty tacos and enchiladas. But flour tortillas are so versatile. It’s great to be able to make your own truly low sodium version. Shambo, thanks so much again. And huge thanks to Ann as well! The last few tortilla recipes I’ve tried have flopped, but these look gorgeous! I’ll have to give ‘em a try. Thanks!! p.s. I just thought of you when I posted a salted caramel ice cream recipe. so sorry. Avert your eyes!! I made these last night for dinner. Since my low sodium lifestyle started in February I have really been missing flour tortillas. These were perfect. I made fried chicken tenders with a recipe from Sodium Girl and made a low-sodium buffalo chicken wrap. It was exactly was I have been crazing. Thank you so much!! I found your website during one of my cooking slumps and it has really helped. I adore tortillas and so do my family but you re right, way too much sodium in most brands. Corn ones are lower but I prefer the flour type for most of my tex-med dishes. Will definitely give this a try!! Anyone had any success in finding low sodium prepared spaghetti sauce (i know I can make it but sometimes I need something quick for last min company). I know this won’t necessarily help you this year but I just make my own with fresh tomatoes and can it. Last year we did 54 quarts, this year with the flooding in my area I wasn’t able to get as many tomatoes so we only did 35 quarts. It is a process but I only want my own sauce and this way I know exactly what is in it. Jennifer – I stopped by earlier and rubbed my eyeballs ALL OVER your ice cream. Would have licked the screen too, but I didn’t want to risk it. LOL! Looks amazing! Kelly, I’m so happy you tried and liked them so much!! Your buffalo chicken tenders wrap is making me droool. Elena, I like corn but I really prefer flour tortillas. I hope you try them! As for the pasta sauce, I agree w/ Kelly. I tend to make my own (and this summer it’s been easy b/c of the garden surplus). But when I buy no salt added premade sauce from the store I tend to go with Trader Joe’s – they have a decent NSA jarred brand – or I get this NSA added version of Francesco Rinaldi. Do you have any recipes for corn tortillas? Hi Kathy, I’m sorry I don’t. Corn tortillas are traditionally very low in sodium, so I’ve never bothered making from scratch. Best of luck to you! 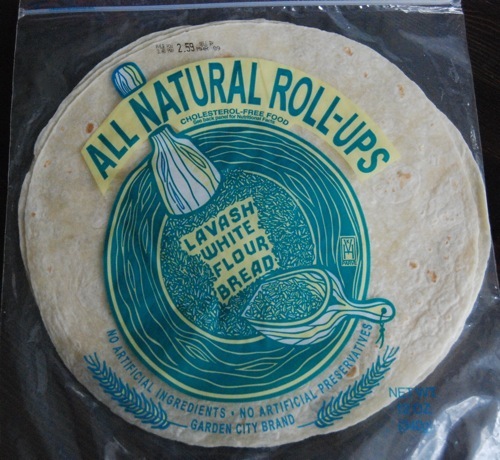 I have been buying the Garden City Lavash at Whole Foods for awhile, and I have used it for wraps and for dishes requiring flour tortillas. Lo and behold! Yesterday I visited two Whole Foods stores, and they no longer carry this product! The wraps they carry now have 170 mg of sodium for a smaller portion. I emailed Garden City to see if they still make them. What a bummer! Oooh Andrea! Say it ain’t so! Wahhhhhhhhh…. I will have to check out Whole Foods here in Portland and see what’s what. I keep a stash frozen typically, so hadn’t heard about this. Sadness. Can you freeze the tortillas? For how long? PS: Not sure how long they’ll last when frozen. I tend to use frozen bread within a month or two at most, simply to reduce freezer burn. If you’re going to keep them frozen for an extended length, be sure to store them in freezer bags, or even double-bag them. Is there a substitute for the vegetable shortening? I would like to buy an enamel frying pan for tortila cooking. Do you think that if i put a heat defuser under the pan the tortila will not stick hard to the pan but will cook well on a low to medium gas strength. I ask because i do not wish to use the alternative pans such as non stick, stone finish or iron.